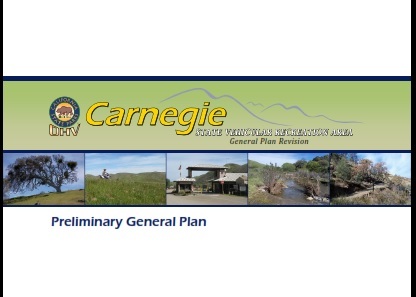 February 4th & February 5th 2016: The Off-Highway Motorized Vehicle Recreation Commission to vote on authorized the Carnegie SVRA General Plan and approving the long-awaited expansion. It's is very important for as many supporters of the Carnegie Expansion to attend the tour of the SVRA on February 4th, and Commission Meeting on February 5th. The PowerPoint Presentations from the workshop are on the first row. The Carnegie General Plan and Draft Environmental Impact Report are the second row. Have your voice be heard! Download the form to the right, and submit it to State Parks using the information on the header. 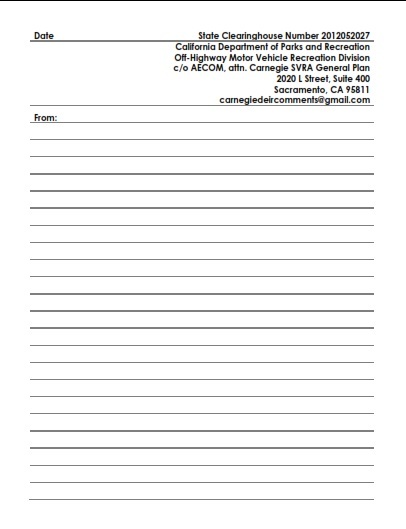 Use one form for each comment - send by email or snail mail. 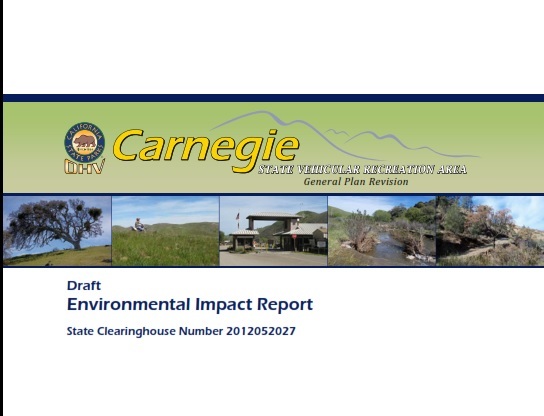 What: The Carnegie SVRA Preliminary General Plan and Environmental Impact Report for the Tesla Expansion has been released for public comment. 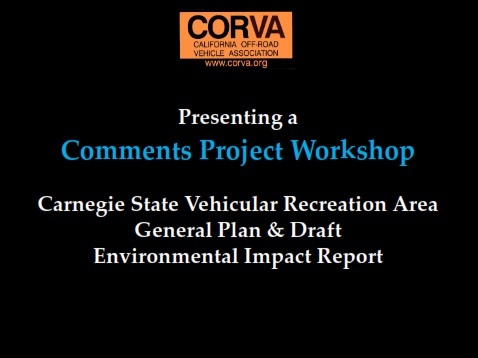 It is a programmatic document combining a continuation of operations for the existing footprint of Carnegie SVRA, along with a plan for the future development for OHV use of the Tesla expansion. Comments are now due June 29th. The extension was given because some documents related to the Habitat Management Surveys that were requested through a Public Records Act request by opponents of the plan were just recently released, and the state wanted to make sure they had enough time to examine and review these documents so a court wouldn't feel that the state rushed the comment period. Why: Many of the SVRAs are redoing their General Plans, because General Plans should be updated every 10-15 years, and most of the existing General Plans were considerably older. Carnegie's General Plan update was combined with an Environmental Impact Review for the Tesla Expansion. An Environmental Impact Review (EIR) is required whenever there is a substantial on-the-ground development change proposed. The Environmental Impact Review is the document that is most under attack, because the use of the existing Carnegie footprint remains the same. The Environmental Impact Review in this case is an overview - it is general in nature because it is programmatic, meaning it is not site specific. That allows the state the most flexibility for future plans, but also brings up the most questions because of it's generality. For example - specifics regarding future trails in the expansion area in regards to endangered and threatened species will only be completely analyzed when future site-specific analyses undertaken. This has been the area where the opponents have gained the most political traction have attacked the EIR by showing the worst possible conditions existing currently at Carnegie. Truth is, conditions in regards to species at Carnegie SVRA are excellent - the state has shown increases in all the important indicator species. The staff at Carnegie has done an amazing job, and every measurable environmental condition has seen excellent improvements from years past. This General Plan and Environmental Impact Review WILL NOT avoid future legal challenges. 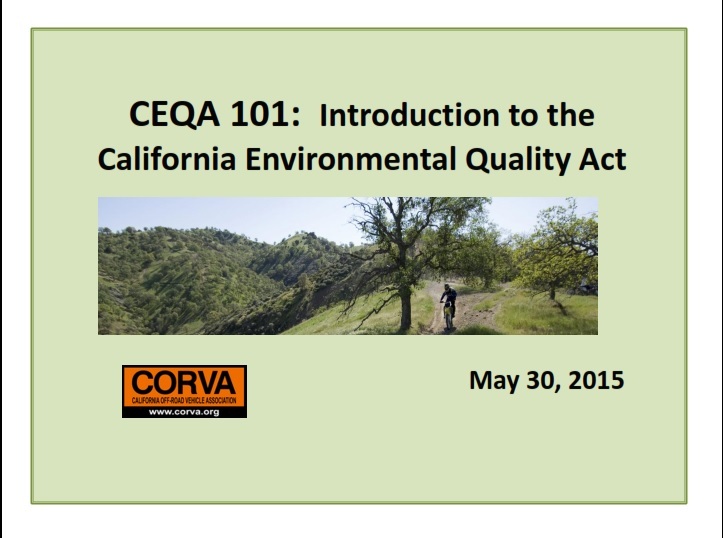 They are CEQA (California Environmental Quality Act) documents, which almost guarantees that they will be challenged in court. Anything and everything in the document is open to legal challenge by opponents who have legal standing, i.e. have been involved in the process from the beginning and filed substantive comments. In most cases whether the opponents win or lose, their court costs are paid by the state. If they lose, only a portion of the costs are reimbursed; but if they prevail on any portion of the lawsuit their costs will be paid by the state. This money will come out of the budget of the OHV Division. US: Everyone needs to be involved with this process. The state is receiving a lot of very critical and substantive comments from opponents to the plan. That means the OHV Community needs to balance the scale. Form letters and letter generators will not balance the scale because they are basically repeating the same thing over and over, and are counted, but not considered. Substantive comments can be crafted from emotional statements like "I support this plan" but it takes quoting a section of the plan, or commenting on a particular element of the plan. Mentioning a particular paragraph or aspect of the plan as written in the EIR helps to focus the comment and make it substantive. We are positive that CORVA, Cal4, AMA and BRC will write substantive comments - that makes 4 -5 substantive comments. The opponents are working with attorneys and will easily submit at least 50 -100 substantive comments. They will come from every environmental group possible. These people know how to pick apart a plan to set the stage for future legal action. THEM: Friends of Tesla, Native Plant Society, Sierra Club, Native American groups, PEER, Karen Schaumbach, and a whole long list. Celeste Garamendi and Mark Connolly own the ranch adjacent to Carnegie and have been complaining about operations at Carnegie for years. Mark Connolly is an attorney himself, and affiliated environmental organizations have ample access to legal advice. June 29th: Comments are due. May 31st: Comments Project at La Quinta Inn, Livermore. We'll be there at 9:00am, come when you can! 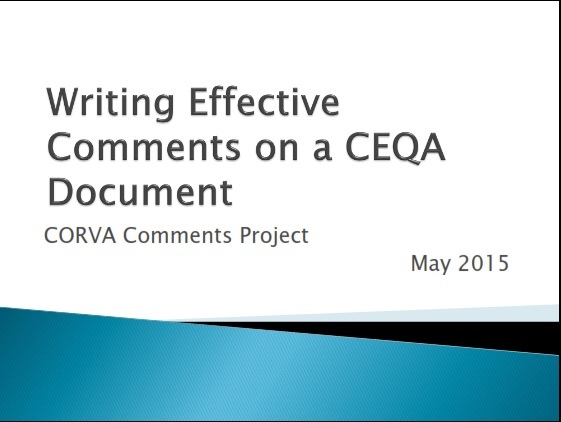 WHERE: CORVA is holding a Comments Project workshop on May 31st, at the La Quinta Inn Livermore. It will be an event, and everyone will leave the day with at least an outline written, if not their comments finished! We will be taking pictures of people and writing down their experiences with Carnegie to create a binder that can be given to politicians, Commissions and City Councils. This will be the opportunity for all the passion people have for Carnegie, and their stories about Carnegie, to be presented in a very meaningful manner. To counter the pictures of flora and fauna the opponents give out at every opportunity, we can showcase our best asset - our families, children and everyone who has had a positive meaningful experience at Carnegie. With the help and advice of an attorney we will be targeting the best statements to make to support the expansion at Carnegie. 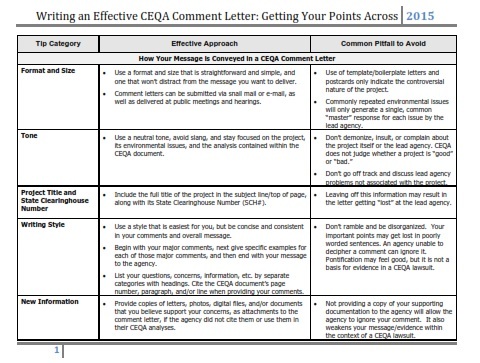 The opponents have advice from CEQA legal experts - now, so do we! Everyone is welcome; we will have music, balloons for the kids, and we're open to any other ideas. The important part is for everyone to work together. The stakes are big and we welcome everyone to work with us and walk figuratively together side by side to benefit the entire OHV community. "Protecting off-road recreation for future generations, promoting off-road access for everyone"